I'm currently attempting to recreate a routine that was made famous by a number of Victorian Era magicians. The routine has been known by many different names, but the most common was The Flags of All Nations. Interestingly, the routine had as many variations as it had names. First created by the Viennese magician Johann Hofzinser, he called his creation The Patriot. The basic effect is that a number of small flags transform into larger flags and eventually into one or more fans of flags and then a giant flag and flagpole appear. This was one of the hottest effects of it's time having been performed by all the top pros of the late 1880s and early 20th Century. So popular was this trick that it appeared on many stock magic posters. A stock poster was one that had the image of a magician but no name on it. 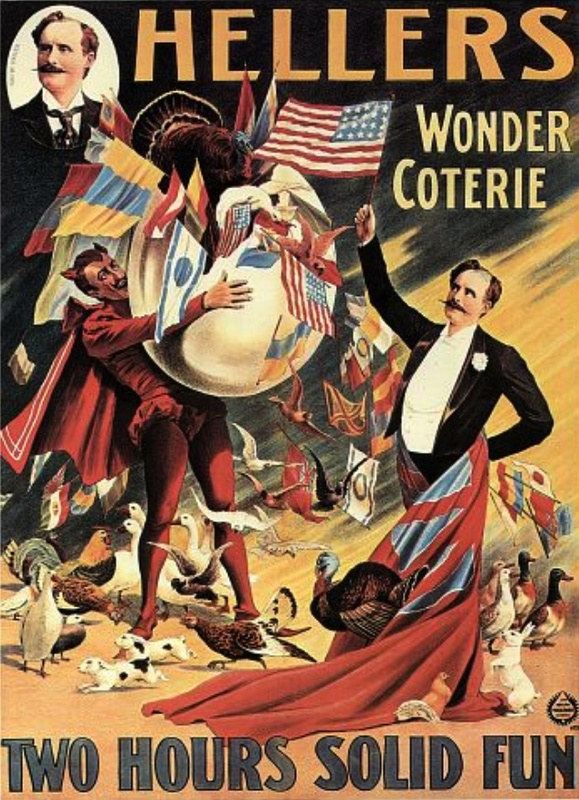 A magician then could add his name to the poster and have his own advertising piece without going through the hassle and expense of the bigger named performers who had to have their posters custom made. My version of The Flags of All Nations is still in development, but above you can see two handkerchief fans. In real life they are multicolored scarves, not flags. But they'll do just fine fitting into the overall routine. I located a number of miniature flags of various nations and also some flags that are almost the size of my silk fans. I only need a few more pieces and I think I'll have all the items I need to recreate this mystery from the past. If you're wondering why this was such a popular routine well there are multiple reasons. People were flocking to the United States in droves during the late 19th Century and early 20th Century. They came here to become Americans, but had their roots in other lands. So when a magician produced a flag from the country of their origin it was exciting for them to see. And then when it concluded with the Stars and Stripes, well who would not be proud of that? The wonderful thing about the routine was it was easily adapted to whatever country you were in. For example, if you were in England, the final flag would not be the US Flag but the Union Jack. All the other components of the routine could remain the same but the final flag production would change to the country you were in. Some performers had to learn the hard way about this. One magician was performing in Canada and finished with the US Flag. It actually got boos from the audience because at the time Canada and the US were involved in a trade dispute. So this magician changed the final flag to that of the Canadian National Flag and had much better results. Below is an image of a magician who included among his routines the Flag trick.